James Lawless at his garden where the van broke through the fence and entered his garden. 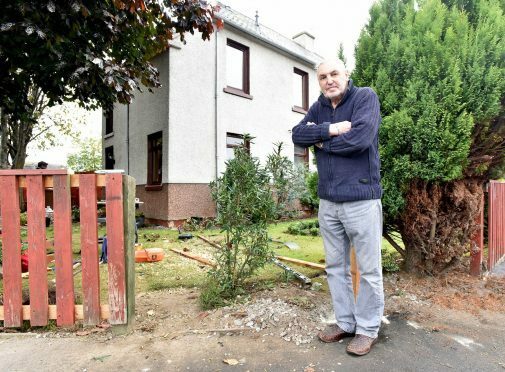 A retired Inverness couple were left “traumatised” after a vehicle crashed into their garden in the middle of the night – the second time they have been hit in three months. James and Catherine Lawless were upstairs sleeping at their Kessock Avenue home, when a white van careered through the fence and slammed into a tree before stopping against their front door. The male driver fled the scene but police are carrying out inquiries into the incident, which happened in the early hours of Tuesday morning. Hundreds of pounds worth of damage has been claimed through insurance for the couple’s fence, house wall, front doorstep and outdoor light – and the van also narrowly avoided striking a gas pipe. In July, a car crashed through another part of their garden fence and damaged a car parked in their driveway, and police promised to step up patrols in the area following this and other reports of crashes. Mr Lawless and his wife, Catherine, are now pleading with police and Highland Council for more action to be taken to prevent a repeat which they say could end with more serious consequences. Yesterday Mr Lawless, 72, said: “The van only just missed a gas pipe at the side of the house, and if the van had burst into flames we could have been burnt to death in our own home, as it was blocking the only door. “If it had been in the afternoon, with children playing around outside, a kid could have been killed, or we could have been in the garden and there is no way we would have escaped that. The couple were woken up by a bang from outside at about 3.45am on Tuesday morning. They initially thought it was a bin falling in the wind, but a second “almighty crash” against the tree moments later caused them to jump out of bed and run downstairs. Mr Lawless said that when he opened the front blinds he saw the white Transit van up against the wall of his house, covering his front door, with the driver inside attempting to reverse out. Police arrived 15 minutes later and recovered the vehicle.